It is with sadness that I write to you that Edna has died, following serious digestive tract complications arising from her MS diagnosis. Her condition deteriorated a lot this past year, leading to a couple of long hospital stays. She died at home in her London flat with her main carer and friend, Kieron. Edna was in her mid to late forties. In 1985, Edna was diagnosed with Multiple Sclerosis a diagnosis she still questioned, right up to the day she passed away. 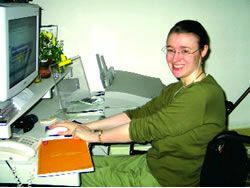 In 1998 Edna also found out she had an under-active thyroid; it was this diagnosis that encouraged her to found the wonderful scientific web site Thyroid Research. She said: I read a book on the thyroid and was amazed by how much could be affected by it, I decided to follow up the references at the back of the book, and so the project began. Today, thyroidresearch.com holds over 1,200 abridged articles on the diagnosis and treatment of thyroid related illness, photocopied from books and journals in The British Library and scanned onto her computer at home. She said: At one point I was spending 70 a week on photocopying. I just feel so passionately about this. What has shocked Edna most, and what she talked about most animatedly, is the medical research by long-dead doctors that has been lost over the passage of time. Edna said In the 1880s when they wrote about the thyroid they thought theyd found the elixir of youth. There is all this incredible work that had just been forgotten about. The website sprang from a determination that the knowledge of thyroid function in many common illnesses is made available. Edna thought at the start that if she could just help one person it would be worth it, and she soon learned that she had helped many, many more than that. and her research will continue to help so many more in the future. Ednas health had declined in recent months and she was not getting to the British Library as much as she used to, but she continued adding to the website from a backlog of copied articles. She said I worship The British Library and I feel I have this queue of long-dead doctors and physicians looking over my shoulder encouraging me, and This is what I have built my new life around before all this happened I was a singer and a psychotherapist, I just cant believe how much things have changed. Edna will be greatly missed, but her work lives on. I was fortunate enough to have met Edna and we have corresponded since. I first met her at Dr Skinners original IOP Hearing in London. Everybody found her to be a warm, kind, funny person who was totally dedicated to thyroid research and to make this available to all who will read it. I know that without her research, Thyroid Patient Advocacy would not be where we are today. Edna and her work has been an inspiration to me personally and helped so much with my work. Thank you dear Edna. Our condolences have been passed to Kieron Deahl, a very close and dear friend of Ednas.